But why don't I think of myself as A MOTHER? (And definitely NOT a Super Mom, although I should note that they're being tongue-in-cheek, as evidenced by the example graphic above.) I'm thinking it's because society has always painted a picture of how moms are supposed to be (ever selfless and giving, perfectly primped, never disheveled, always has dinner ready for the family, makes everything from scratch), and even in our current era, there's STILL this expectation of what motherhood looks like--this Pinterest-perfect, organic-foods-only, dropping-the-kids-off-at-all-their-lessons-before-squeezing-in-a-yoga-class image of motherhood--that persists, and I AM NOT THAT. But my child is kind. She is helpful. She is hard-working and respectful to others at school. She is healthy and strong. She is LOVED. We have our inside jokes and favorite places and shared hobbies. Everyone tells me that my kid is a good kid, so I try to take them at their word and just keep it up. So, I don't know. Yes, I am a mom, but I still have a hard time thinking of myself that way, because I do not feel like I fit societal expectations of "mother." 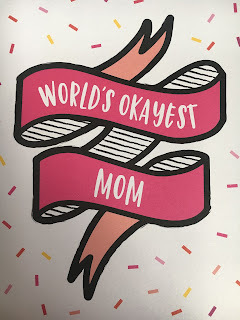 Moms are judged so hard for everything that they do and don't do, and it's exhausting, because really, the first and foremost person that I should be answering to here is my own kid, and by all accounts, she is happy with my momming, so I don't know why I have such a conflicted relationship with this part of my identity.